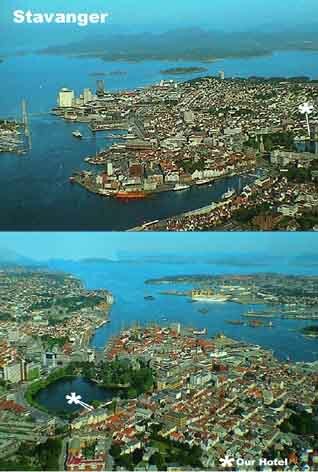 We pulled into Stavanger at 7:15 PM with the sun shinning and it was beautiful. It took us 4 hours to travel 150 miles. These two lane windy roads really take it out of you. We arrived in the center of town where all the action was but had no idea where our hotel was. 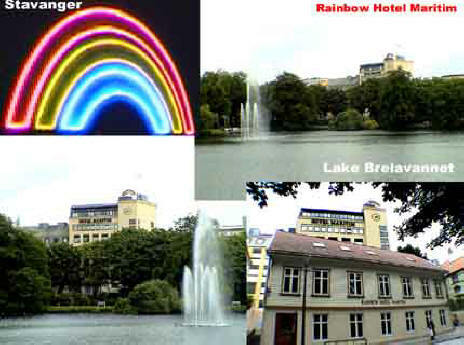 The beautiful blonde at the Stavanger hotel had booked us into the Rainbow Hotel Maritim (below left) [Kongsgate 32, +47-5-185-0500] located on Lake Breiavannet. We stopped at the edge of the old town and I walked into the local Phileas Fogg Pub and asked for directions to our hotel. 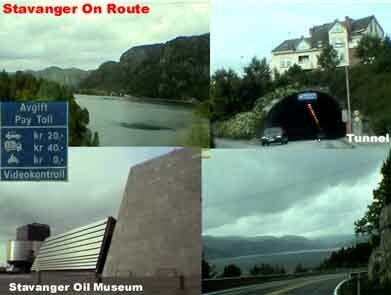 They were very helpful directing us back up the hill to the other side of the main road and the lake. We drove around the lake and finally found the Maritim and we checked in at 7:30 PM. After unpacking, we walked back to the old town area and chose from the many bars and pubs, the Cardinal [, +47-] for a Boddingtons beer and wine. 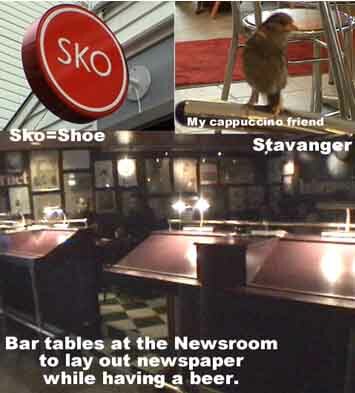 From there we went to a place called the Newsroom [, +47-] for a Kilkenny's beer and wine. The place was very interesting in that they had these large slanted tables to allow you to open and read a newspaper while having your beer. 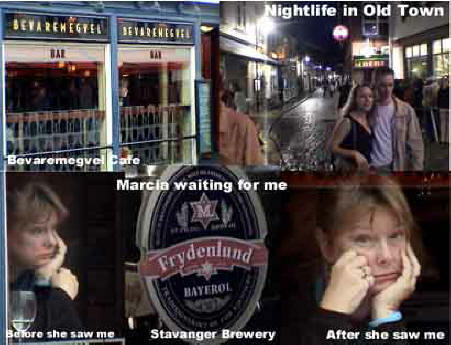 The barmaid was very helpful in telling us what we had to see while here in Stavanger. She told us the most important was the famous Pulpit Rock (Preiskestolen) which is located 7 miles up the Lysefjorden and reached by a two hour climb straight up hill. 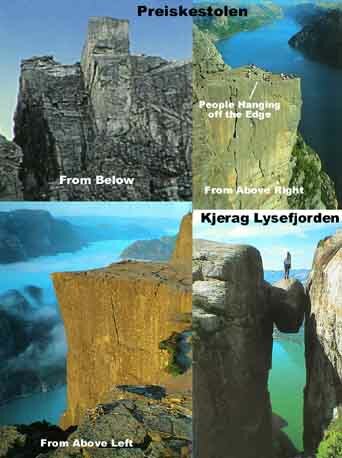 As can be seen by the pictures it is really something worthwhile seeing, especially to hang out over the edge of the 2000 ft (610 m) drop to the fjord below. For some reason Marcia & I could not get up the will power for the two hour climb. So we missed seeing this. After snooping around the town, we finally settled on the Allegro Ristorante, an Italian place for dinner. Several people had recommended it. Our enticingly exotic waitress, Siri (below right, center,) is Italian, going to law school and planning to marry another waiter here who is from Croatia. We discussed her concerns of religious differences. We sat next to a group of businessmen from Tokyo and had an interesting chat with them. It was a very warm and cozy place. I had prosciutto with melon followed by linguini with scallops while Marcia had fish. We split a Greco di Tuffo wine and an apple dessert. The meal was wonderful. We walked back to the hotel and they let me use their computer to do email and send out Diario #5. We also decided we liked this town enough to stay here another night. We got to bed at 3:30 AM. I woke up at 9, and again at 11:45 and finally got up. At 2 PM they made us move to another room since we are staying an extra day. Now we’re way off in the far part of the hotel instead of a convenient room. At 3 I went for a run around the lake in front of the hotel. It was perfect weather for a run. 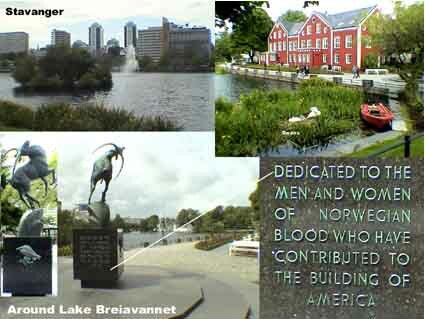 I came by a monument with an elk that was dedicated to all those of Norwegian blood who helped build America. There was also a couple of baby swans in a nest next to a boat – a very lovely scene. 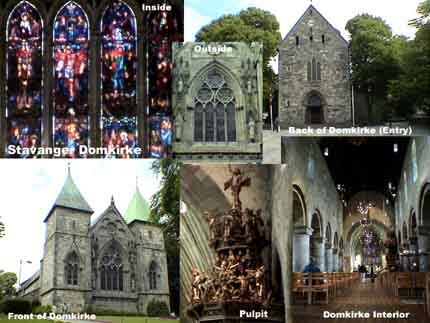 I went around to the area of the Domkirke. The original church was built in 1100 but burnt down in 1272 so it was rebuilt. The two towers and façade were added in 1747. The Baroque pulpit was created by a Scottish immigrant, Anders Smith in 1658. This is one of the oldest medieval cathedrals in Norway. 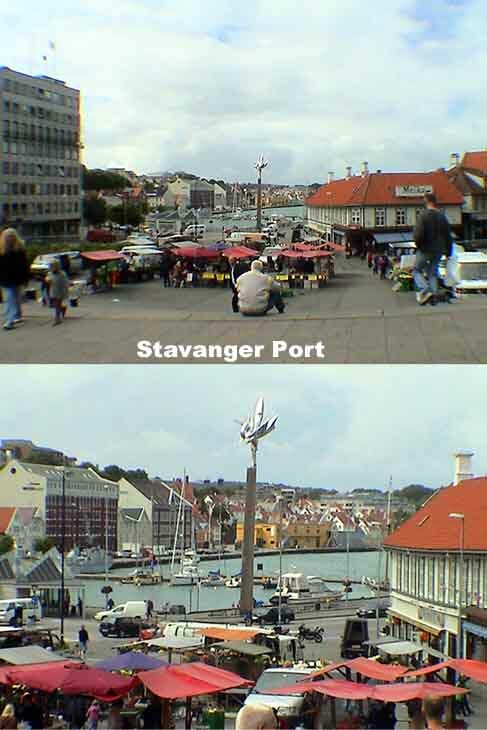 From here I wandered over to the port area (Vågan Harbour) which is very beautiful and clean. I’m glad we stayed an extra day. 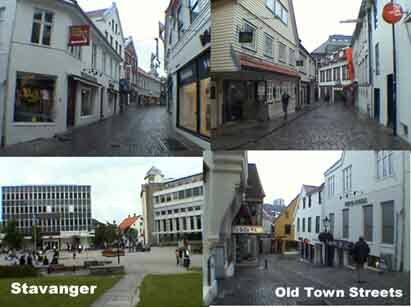 I then wandered the streets of the old town (Gamle Stavanger) with its many modern shops and cobblestone streets. There a certainly no shortage of shoe (sko) stores. I finally settled for a cappuccino at Le Café Français which was run by Turks. I relaxed and worked on photos while a little bird came and joined me for quite some time. I walked around some more looking for good restaurants and found where we would go tonight. At 6 I went in for a cappuccino at Café Italia when Marcia called and told me she was having a glass of wine in the place exactly two doors down. When I finished I went back to the room and changed and joined Marcia at Bevaremegvel for a glass of wine at 7:45. I caught a candid shot of her gazing out at the passing crowds. By 8:45 we wandered in the rain to Munken (Monk’s) Bar which was a neat place one level down. It was interesting watching the Norwegians relaxing. The bartender told me that the town’s local brewery Frydenlund Bayerol had just been bought up by the major Norwegian brewery and they were closing down the brewery here. So noone was going to drink either brand anymore. 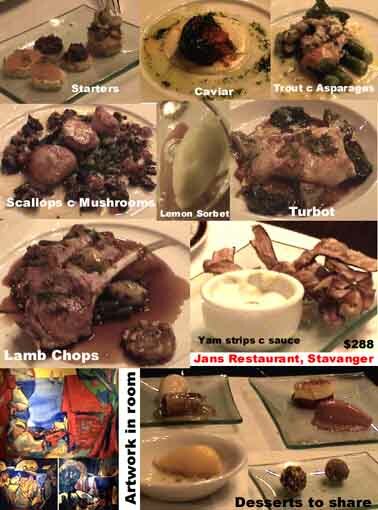 We left there and went to Jans Restaurant that I had found earlier. It was also in the basement level of a large old building but done up beautifully. We had not expected what we were in for. We decided to have the fixed menu and it was quite spectacular but a little costly at $288 for the two of us. We had a bottle of Sauvignon Blanc (the cheapest on the list) and after several assorted pre-appetizers, we each had an order of trout with asparagus and a serving of turbot. I had a dish of scallops with chanterelle mushrooms and then we both had lamb chops. This was followed by a large assortment of eclectic desserts. The whole thing was very very good and quite an experience. Needless to say we walked backed to the hotel in the rain very slowly. The hotel again let me use the internet so I did email and sent out Diario #6 and got to bed early at 1:30 AM.